The Religious of the Assumption, a women’s religious order with convents in Lansdale and West Philadelphia, elected Sister Martine Tapsoba as the order’s superior general July 17. 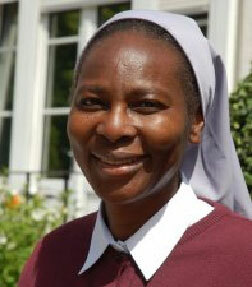 Sister Martine Tapsoba, R.A., of Burkina Faso, elected superior of Religious of the Assumption. She is the order’s first superior general from Africa and replaces Sister Diana Wauters from Allentown. Sister Martine, 53, is from Burkina Faso, West Africa. She was a member of the general council from 2006-2012. Previous to that she was provincial superior of West Africa (composed of the countries of Burkina Faso, Ivory Coast, Benin, Togo and Niger) and novice mistress. In 2008, Sister Martine came to the Archdiocese of Philadelphia when she visited the Assumption communities in West Philadelphia and Lansdale. Sister Diana Wauters will return to the U.S. Province in August and go to New Mexico.